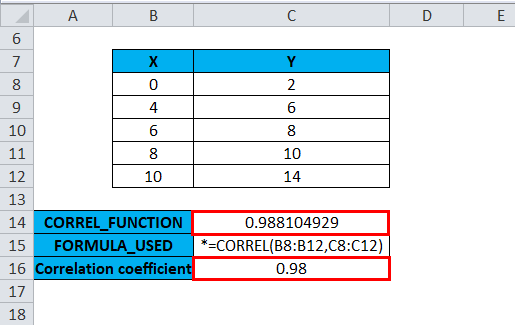 CORREL in Excel (Formula, Examples) | How to Use Correlation in Excel? How to Use CORREL Function in Excel? Prior to CORREL FUNCTION, you should be aware of Correlation coefficient. Correlation coefficients are expressed as values between +1 and -1. Array1– It is an independent variable. It is entered as cell reference or range of values. 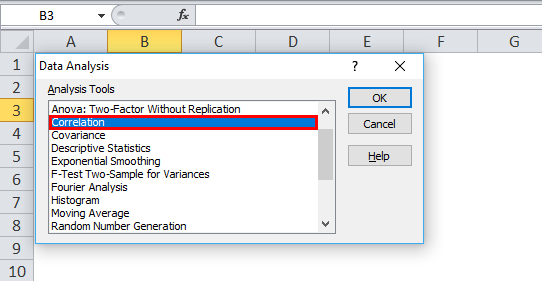 Array2– It is a dependent variable. It is entered as second cell reference or range of values. 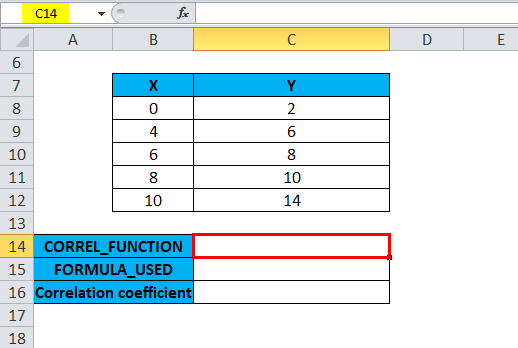 CORREL function is used as worksheet function & also in excel VBA. CORREL Function is very simple to use. 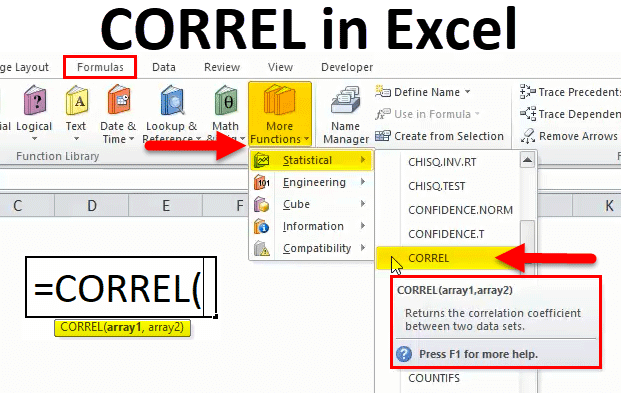 Let us now see how to use CORREL function in Excel with the help of some examples. In the below mentioned example, the table contains two variables, one in the column X & the other in column Y. where both the datasets contain positive values. Let’s apply Correl function in cell “C14”. Select the cell “C14” where the Correl function needs to be applied. 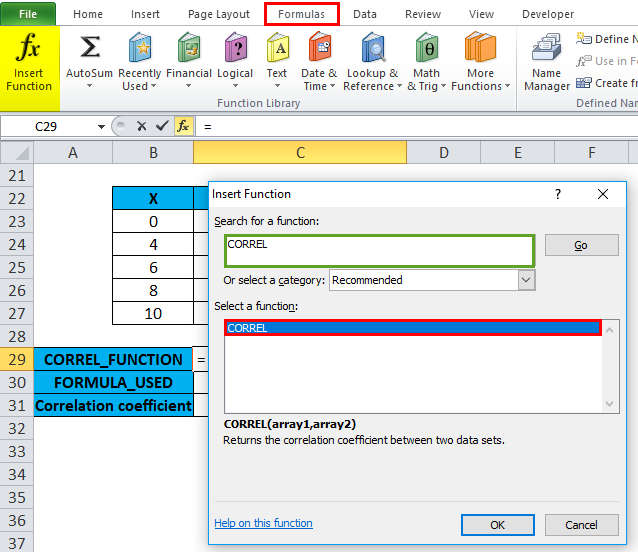 Click the insert function button (fx) under formula toolbar, the dialog box will appear, Type the keyword “CORREL” in the search for a function box, CORREL function will appear in select function box. 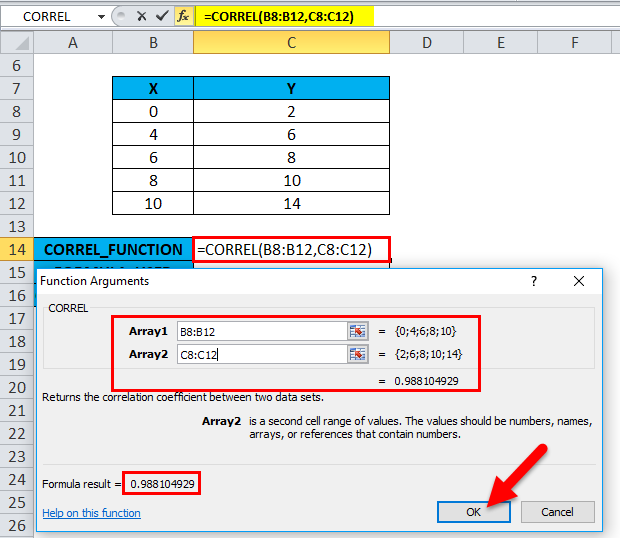 Double click on CORREL function. Chart elements such as , legend series (X, Y) axis title (X & Y axis), chart title (POSITIVE CORRELATION) & data label (Values) needs to be updated in the chart. Let’s apply Correl function in cell “C29”. Select the cell “C29” where Correl function needs to be applied. 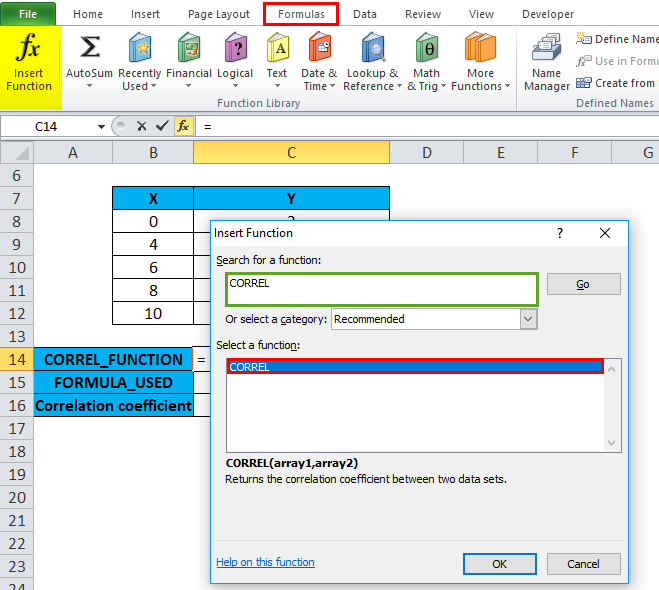 Click the insert function button (fx) under formula toolbar, dialog box will appear, Type the keyword “CORREL” in the search for a function box, CORREL function will appear in select function box. 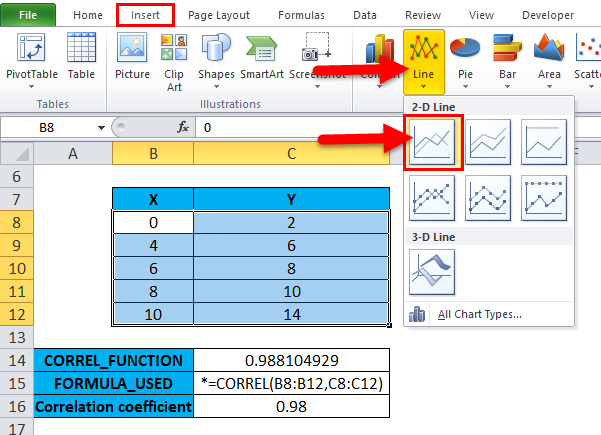 Double click on CORREL function. You can see the negative correlation i.e. Variables X & Y values are negatively correlated (Negative linear relationship). In this case, y decreases when x increases. 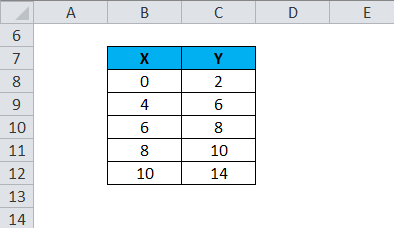 Suppose if Array1 and Array2 have a different number of data points or if the supplied arrays are of different lengths. 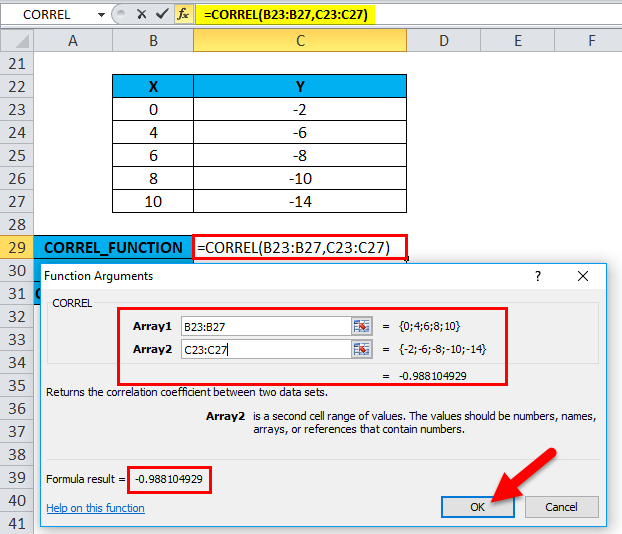 CORREL results in or returns the #N/A error value. The function will return the #DIV/0! error value, if the argument array1 or array2 contains non-numeric data (text, logical values, or blank cells). It’s an inbuild Analysis Toolpak Add-in which is present in application add-ins.